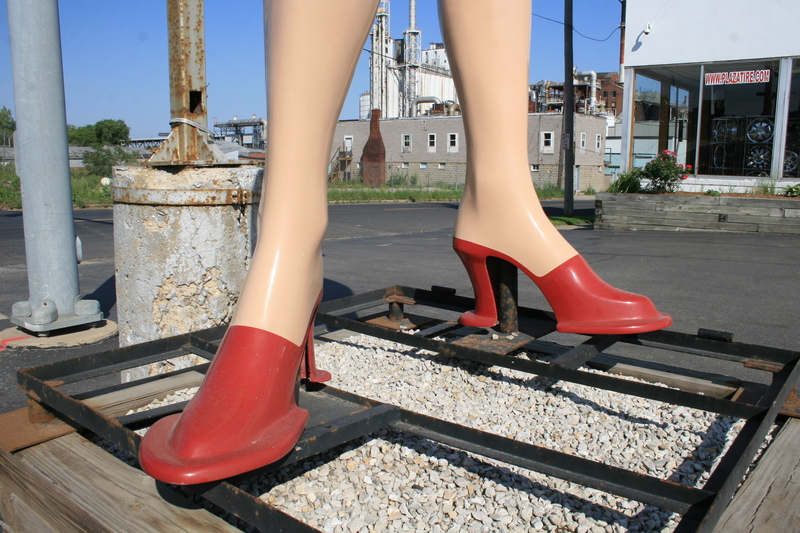 These days the female version of the muffler man is a rare find and many muffler man hunters will drive out of their way to see her. Our case was no different when the American Giants crew deviated to Peoria, IL after visiting the Atlanta, IL Bunyan and before seeing the Gemini Giant in Wilmington. With only about 12 left across the country a uniroyal gal sighting is always a must if your in the area. I had heard about the one in Peoria before planning our road trip (currently being shown in American Giants Episodes) and found her unique in that she gets an outfit change every year. Turns out she is no stranger to Peoria and arrived there 45 years ago in 1968. 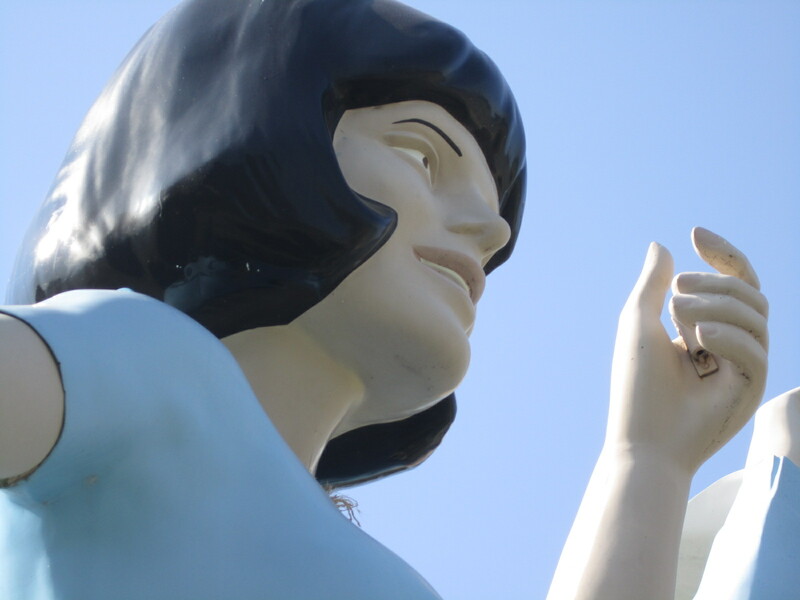 She was part of a grand opening promotion for the Plaza Tire Co. and she was made by International Fiberglass for the Uniroyal Tire Company. Uniroyal had dozens of these giant women made in the mid 60’s to promote their tires and the girls were set up for promotions at participating dealers of Uniroyal Tires. Around the same time she arrived in Peoria another uniroyal gal was shipped to Salem, IL about 210 miles to the south. 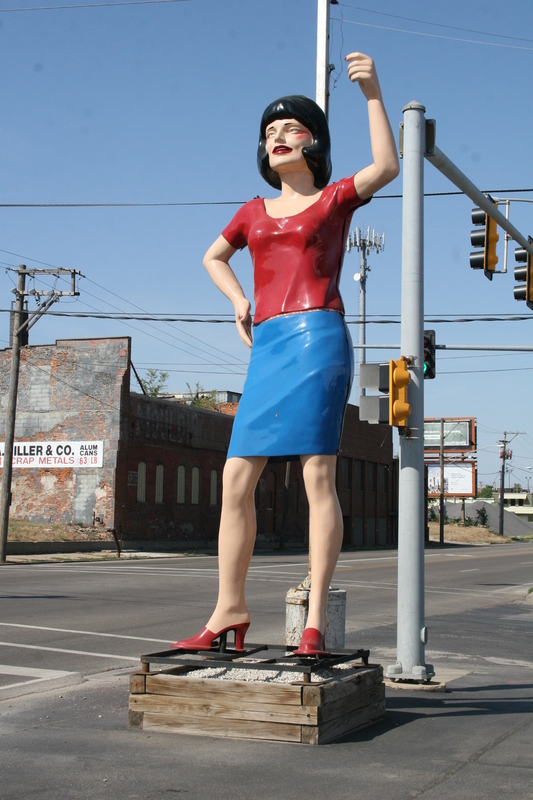 After the promotion the giantess in Peoria was moved around the area to different businesses to help promote tires and other grand openings. After 4 years on the road she was retired in 1971 and given back to the Plaza Tire Co. Uniroyal was moving in new directions and discontinued the Uniroyal Gal program across the country. At this time the giants were either trashed or fell to private businesses and collections. 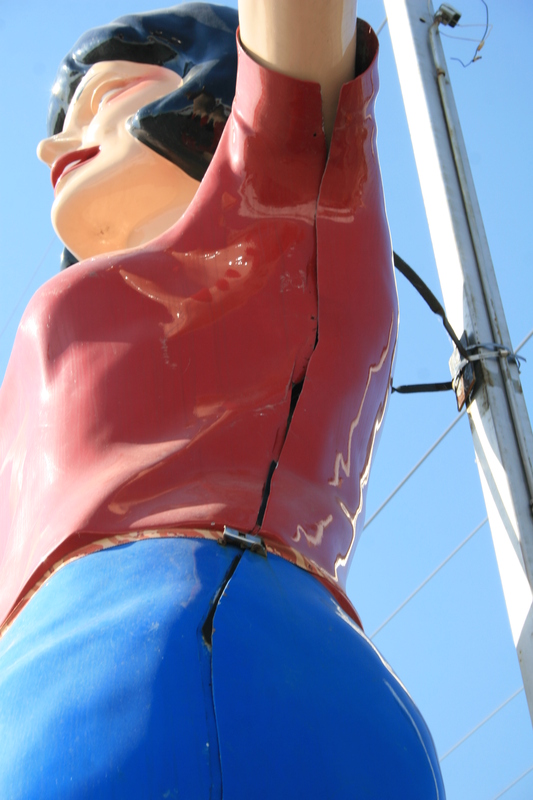 At 17ft 6 inches tall and 450 lb she became a landmark in Peoria and has stood all these years in almost the same spot. Because people kept backing into her legs on occasion she was moved recently to stand on top of a wooden planter to keep her safe from cars. Interestingly if you look at her steel platform it is the same one that she was shipped with from International Fiberglass. 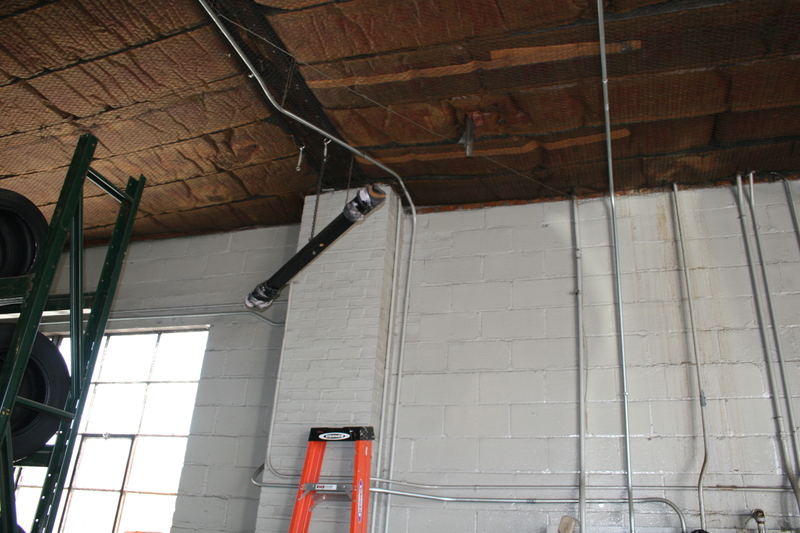 All muffler men shipped on these platforms so the area reps could move them around to different promotions locally. She was recently restored and given a new paint job and renamed Vanna Whitewall! Uniroyal Gals came in a fiberglass skirt and shirt and had the option for these to be removed to reveal a bikini underneath. She is the only uniroyal gal I know of that still transitions between the two every year. During the winter she has on her skirt and shirt and when it gets warm off come the clothes to “announce pool season” as the guys there told me. They also took me in the shop and showed me the giant “clothes hanger” they use to hang her clothes on during the summer months. We got an interview and some great go pro shots while we were there and she was well worth the diversion! She will be featured in American Giants Episode #4. 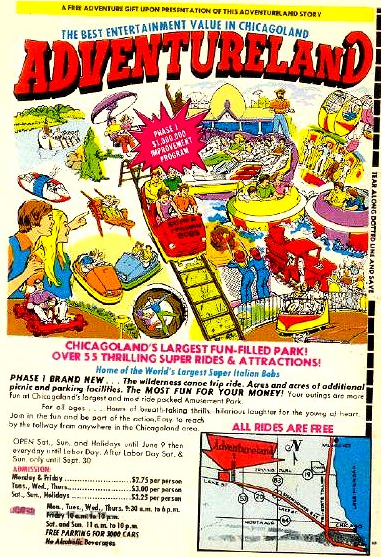 Old Add Picture from Plaza Tire Co Website For Pictures of all Uniroyal Gals still standing today, visit this web site. 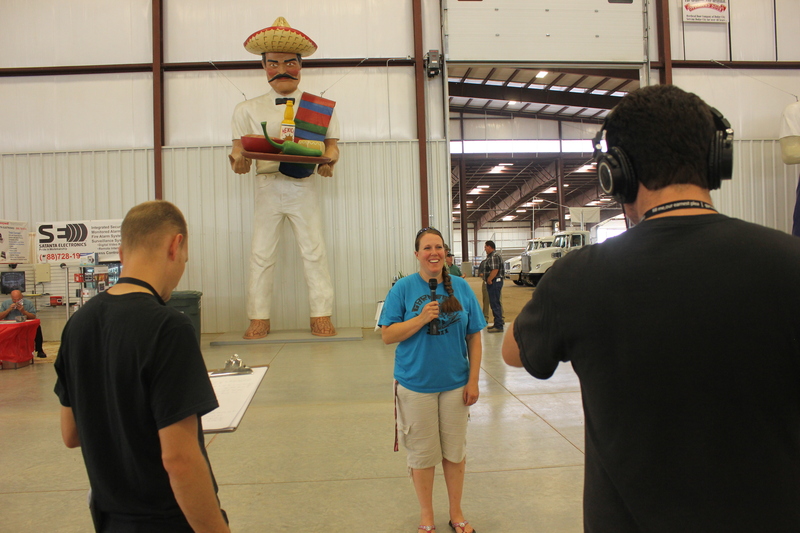 American Giants just got back from an awesome weekend in Dodge City Kansas to cover the Dennis Hopper Muffler men at the 3I event held at the new expo center. We were invited to come out by the Carnegie Center for the Arts who have recently received the Dennis Hopper Muffler Men from the Dennis Hopper Art Trust in California. Travel is nothing new for the Dennis Hopper M Men and they aren’t done yet! They were cast in 2000 and since then at least one of them has traveled the world. They were both cast from a muffler man in LA named Tony who is one of the rare bow tie versions. 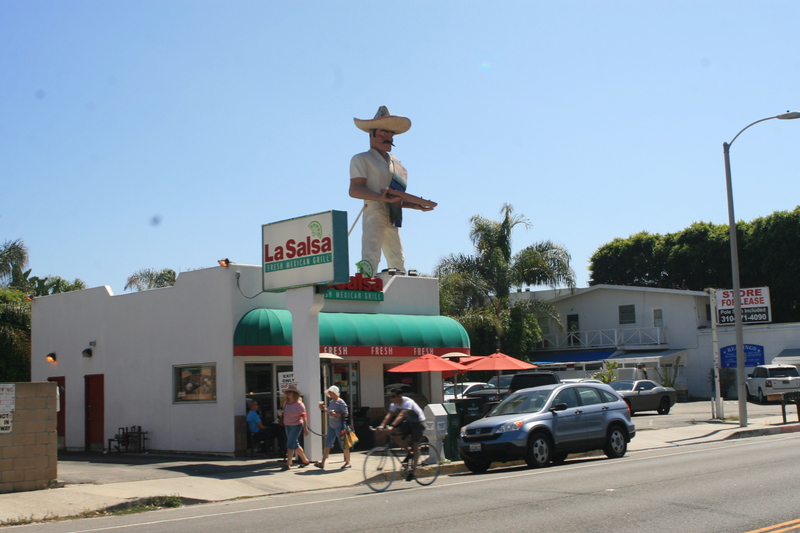 They were each made to resemble popular LA muffler men, the La Salsa man made by Bob Wade in Malibu and the Mobile muffler man that appeared in life magazine back in the day. After being cast it is believed that the only time Mobile man was publicly shown (other then this venue) was in June of 2010 just shortly after the death of Dennis Hopper. 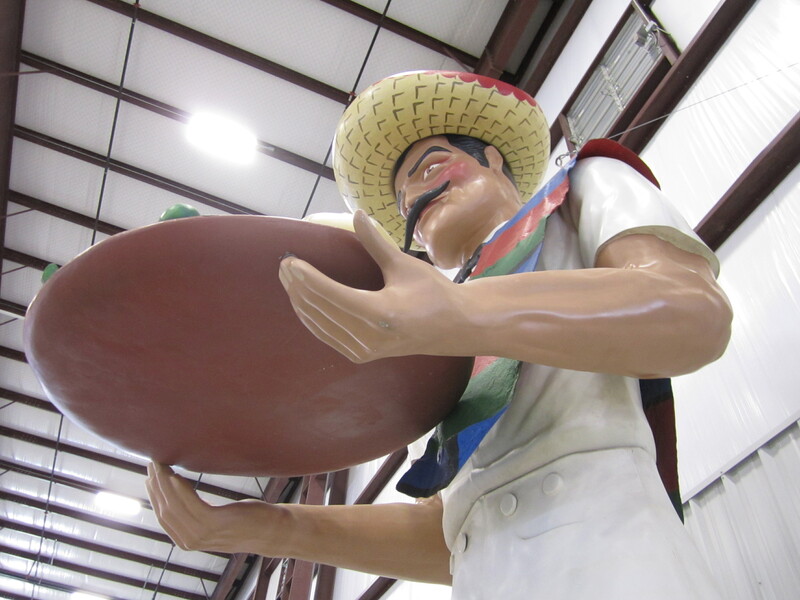 The La Salsa Man however was no rookie to public display and was first displayed in Amsterdam in 2001 and then Paris, Vienna, Melbourne and even rumored to have been on display in St Petersburg Russia at one point. You can tell one has traveled more then the other, the La Salsa Man has it’s share of scuffs and scratches while the Mobile Man is brand new and in almost perfect condition. 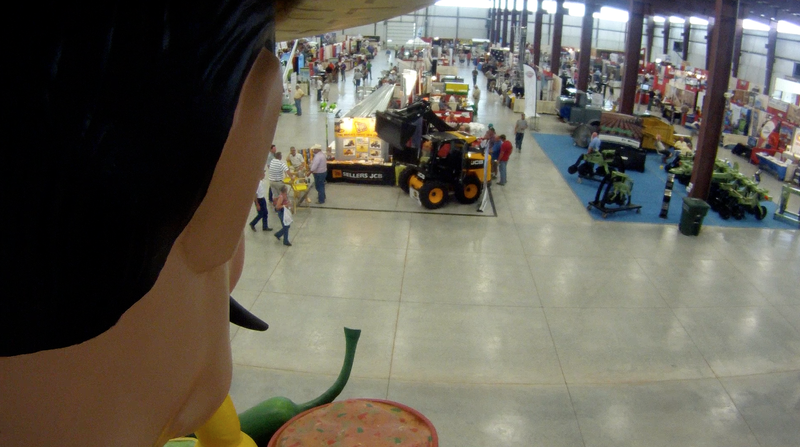 I’ll save a bunch of the details of how it was shipped and ended up at the expo center for the future AG episode but by the time we got there they were all set up and on display. Summer Bates who is the executive director for the Carnegie Center for the Arts is basically the mother of these two boys and she has found temporary housing for them at the expo center where the 40ft high ceilings accommodate the muffler men’s vertical challenges. With the 3i show coming up she got permission to keep them there during the event and invited us out for the occasion. So myself, Bo, Neto and Sam piled into the tiniest car we could find (32mpg) and after work Thursday traveled the 10 hours to Dodge City Kansas. Although promises had been made by each member to equally share the driving some of us arrived at the 3i show the following morning more worn out then others. 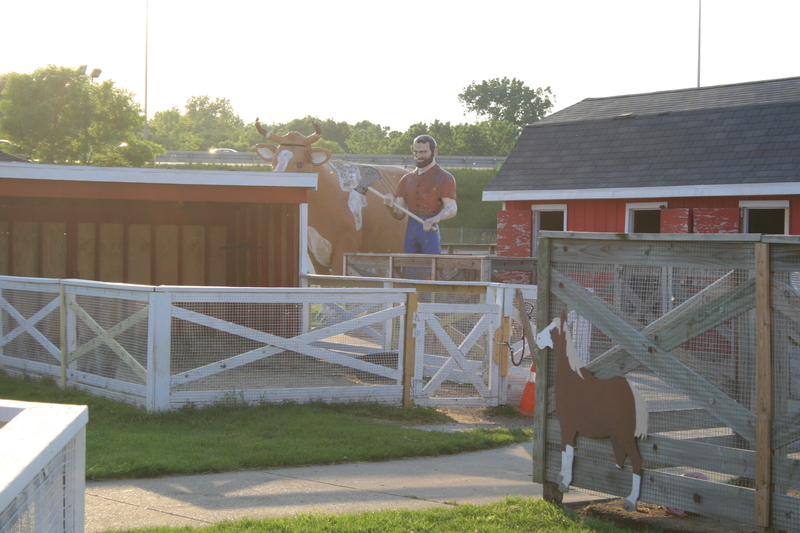 We were immediately welcomed to Dodge by Melissa McCoy who is the project development coordinator for the city and she promptly took us to see the muffler men. In a building that size it makes them look a bit smaller then they actually are but these guys were definitely getting attention. After years in a warehouse they were making up for lost time and at their feet stood interested 3i attendees as well as tables with information about their history as well as a looping video of the Shipping Wars episode. 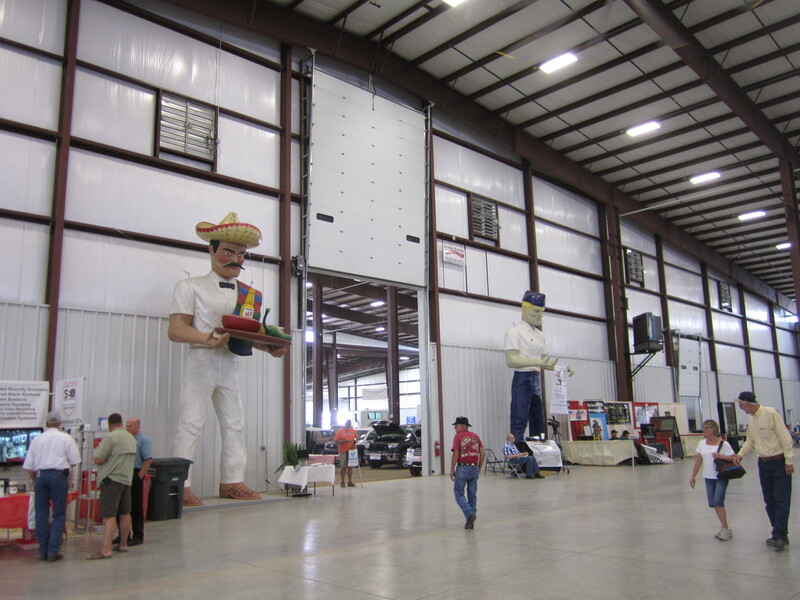 Summer, Melissa and many others are excited about the arrival of the muffler men to Dodge City and welcome the many muffler men followers out there to make Dodge City a stop on their muffler men check list. 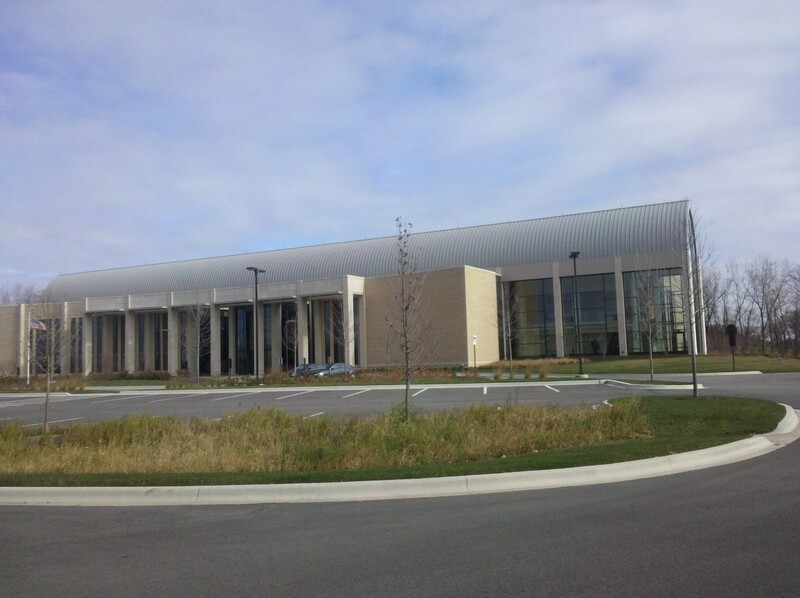 The expo center that is currently housing the muffler men in a temporary solution and Summer is working hard on permanent housing for these guys. After a very full day of not only covering the muffler men but also the 3i convention we left with hours of B-roll and interviews for me to sort out in editing. We also left with a pretty good appetite that Summer took care of by taking us all to Boot Hill Museum Inc for a dinner and gun fight which we enjoyed thoroughly. 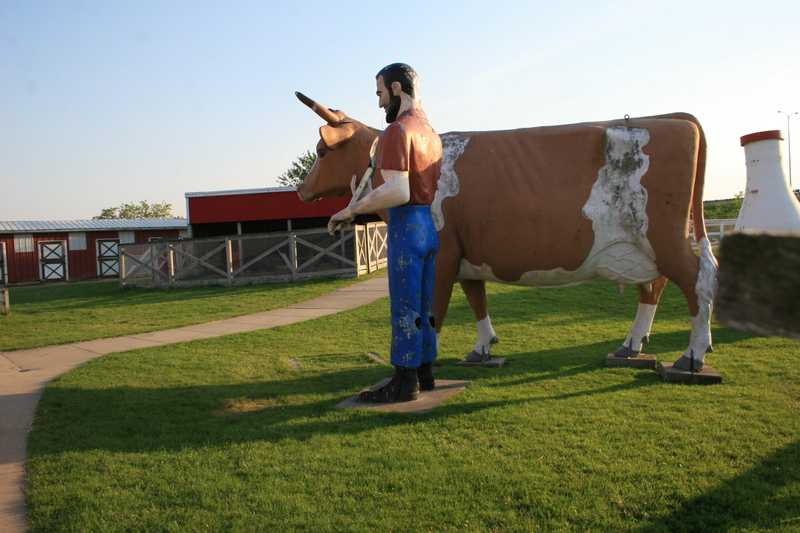 Interestingly a muffler man named Big Matt once stood at Boot Hill many years ago and was finally taken down after his head kept blowing off in the Kansas wind. I was able to track down his story and history and will post a blog about him soon. 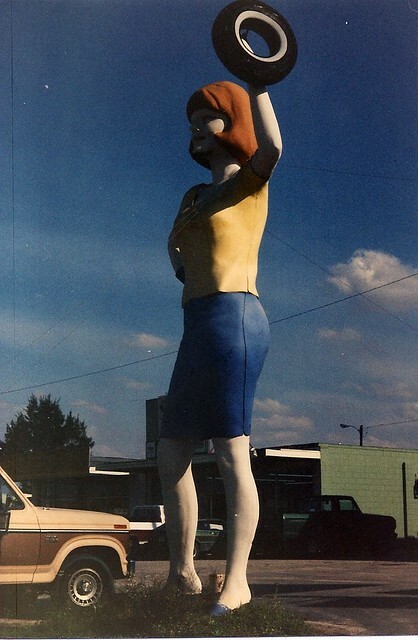 From there we headed to Wichita where we visited the muffler man at Browns Tire (which is apparently worth getting up in the middle of the night for) and also caught up with Greg Holmes (The Lope) the proud owner of a muffler man head, both to appear in future episodes. We came home with allot of new content and information and I just want to sincerely thank Summer Bates, Melissa McCoy, Eddie Estes, Jeff Thorpe and Greg Holmes for making this trip possible and for taking such good care of us. The American Giants episodes are currently taking us up route 66 to Chicago but after they are complete I am planning to bump this Dodge City trip into the next episode. It’s not often two fresh muffler men get added to the charts and maps so make sure to stop by and pay them a visit on your next trip through the midwest. If your interested, check out this behind the scenes clip taken while the American Giants Crew was filming Greg Holmes and his muffler man head. The second episode of “American Giants” is offically released as of July 9, 2013. The episode covers the details of International Fiberglass the company that made muffler men as well as Steve Dashew who owned it. 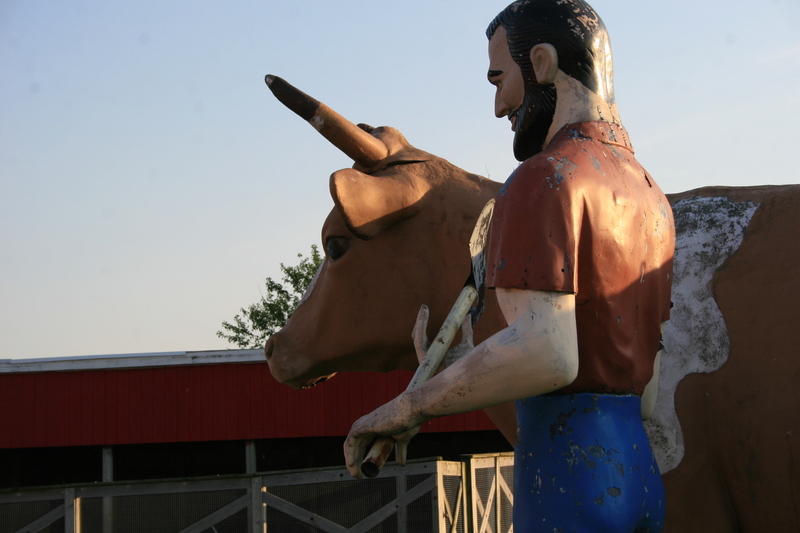 We also continue to follow Joel and the guys up route 66 in search of muffler men. 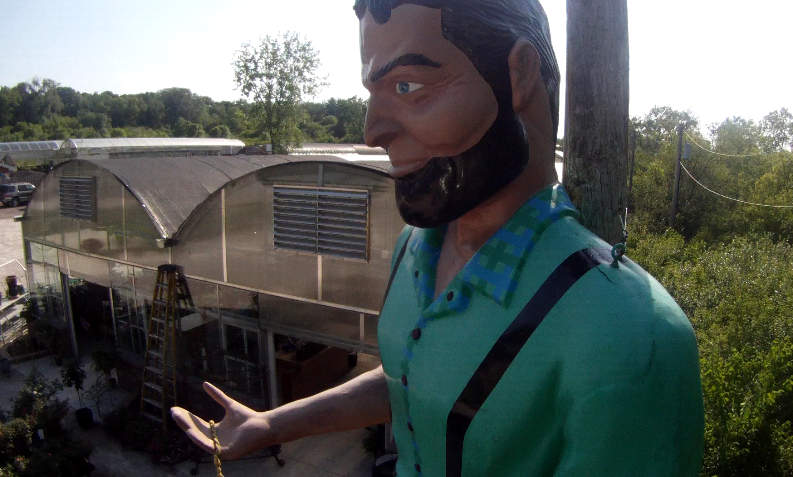 They make their second stop in Springfield, IL and visit the Lauderbach bunyan and talk to his owners and find out some very interesting history. 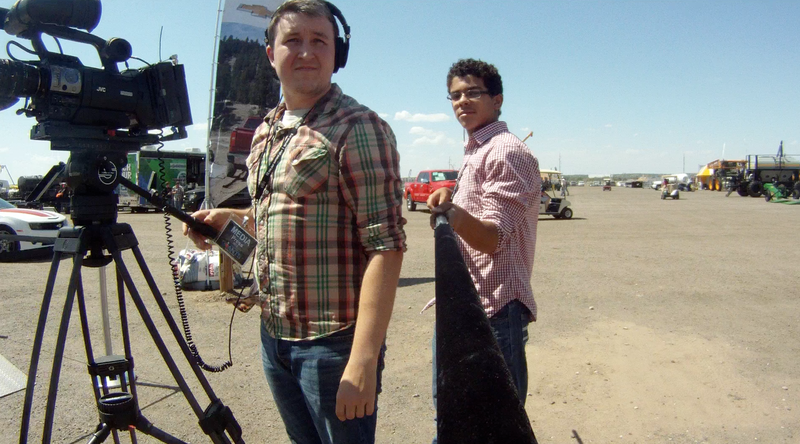 Also Bo makes a cool discovery when he mounts a go pro camera on a boom pole. This episode is a reality due to the help of the guys at Lauterbach Tire in Springfield and also the many photographers and help I got from Roadside America. Again this episode runs 15min and although I tried to keep it under 8 I was not successful. The plan is for future episodes to be under 10 min in length. 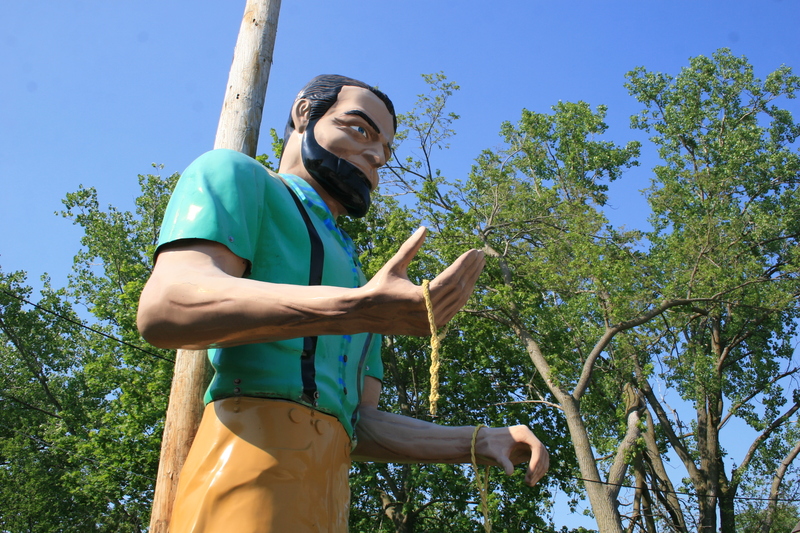 As the Bunyan muffler men began to become popular and more and more businesses across the US started purchasing them International Fiberglass kept on innovating. They first started with the oil giants, Phillips 66, Sinclair and Texaco making versions of muffler men or dinosaurs that could stand that their gas stations and promote their products and business. The idea was a success and the reason there are so many muffler men left today is because most of them were made in mass quantity for oil companies, chiefly Phillips 66. Their cowboys still cover large portions of the US with and without their cowboy hats. The texaco big friend sadly is a different story and Texaco was largely successful in destroying almost all 300 that were purchased except for 4 or 5 of them. 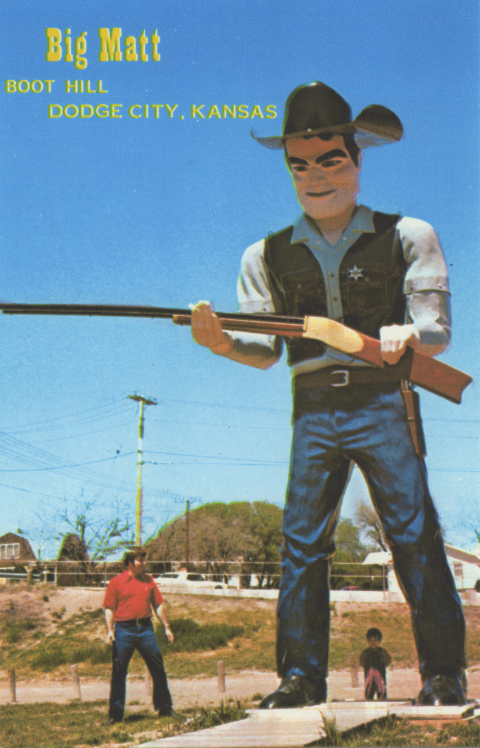 Shortly after Texaco purchased their 300 in 1966 the Uniroyal company also wanted a statue to advertise their tires. 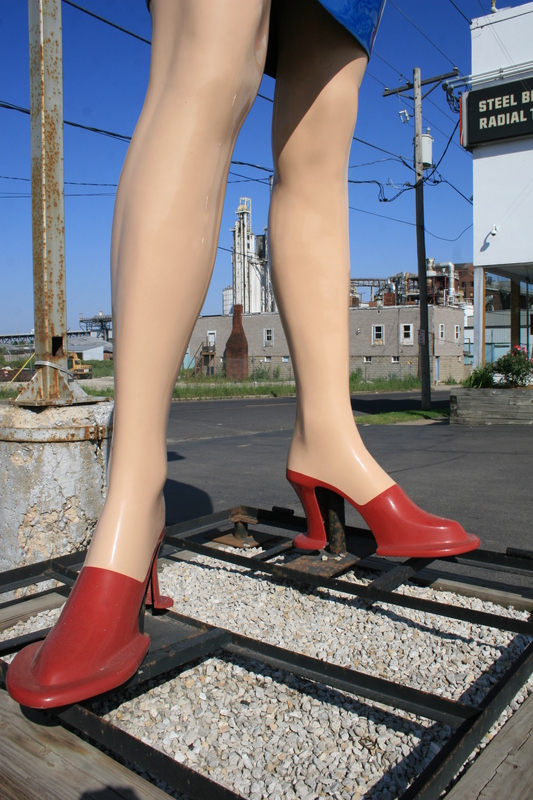 So International Fiberglass came up with the idea to do something different and make a female version of the muffler man. She was sculpted by an unknown artist who supposedly had a thing for Jackie Kennedy and sported an orange bikini. I’m not sure how many were made but altogether I have heard of 17 of them so far and 12 of those are still visible today. Needless to say these are one of the less common muffler men and new sightings almost never happen. International Fiberglass also made a skirt and shirt for the giant lady and these could be put on or taken off at the owners will. The Uniroyal girl in Peoria, IL is changed seasonally and during the winter she wears her clothes and during the hot summer she sports a red bikini. In Gainsville Texas owner Glen Goode even made the skirt of his Uniroyal girl longer so she could be “more holy” as he put it and in WV the Farnham’s Uniroyal girl now sports her newly painted bikini while her clothes lay in the grass nearby. The Uniroyal girl was originally made to stand outside gas stations and automotive repair stores that sold Uniroyal products. Like other muffler men owned by large corporations she was used in promotions and was moved from location to location by the sales reps. She stood on the same platform that the rest of the traveling muffler men and big friends did and you can still see one today under the Peoria, IL Uniroyal gal. I have been asked many time what she was originally made to hold in that raised arm. If you look closely at Glen Goode’s girl you can see a bracket inside her hand used to hold a pole or flag. I was told the Uniroyal Girl in Bradenton, FL once held an oil can back in the 70’s and the one in Blackfoot, ID used to hold a plate of food. However “she held tires” is the answer I am most often given and this would make sense since she was made to advertise them. Sometime in the early 70’s the Uniroyal promotion reached it’s end and in most cases the sales reps simply left the giants wherever they happened to be and so they went in most cases to the owners of the gas stations or repair shops. That is exactly how the Uniroyal Girl in Mt Vernon, IL ended up in the area and for her it was the end of the road. 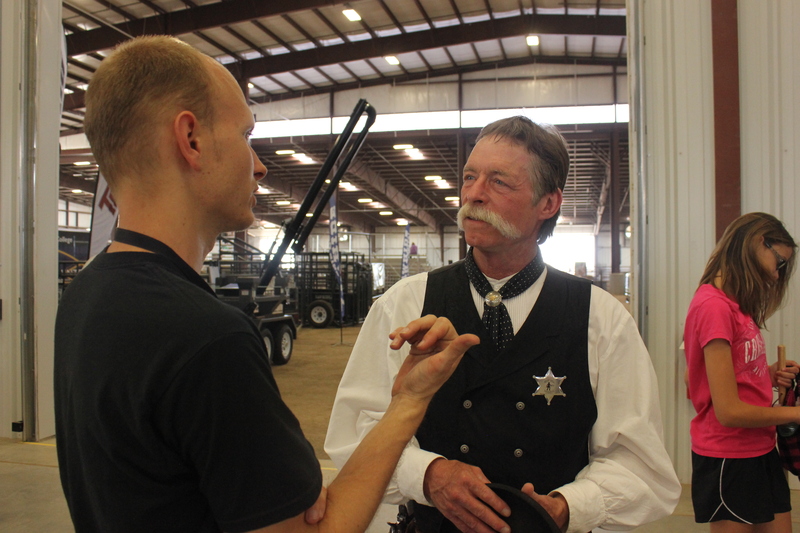 In other cases they kept on being sold and moved, interestingly Glen Goode found his in Wichita Falls and the one now in WV once lived in Mississippi at a fireworks stand. There are many interesting stories about these girls, ranging from angry locals upset over her lack of clothing to roomers that the girl in Bradenton once stood on Gasoline Ally at the Indi 500! I also know one once stood at the The St. James Infirmary bar in Mountain View, CA until 1998 when the place burned down along with the Uniroyal Girl inside. There are a few that have fallen off the charts and seem to be gone for good including the girl that used to stand in Ocoee, FL, Del Rio, TX and Chincoteague, VA. As always muffler men or muffler ladies in this case always keep most of their secrets to themselves and who knows how many more gals are out there and where they might be. 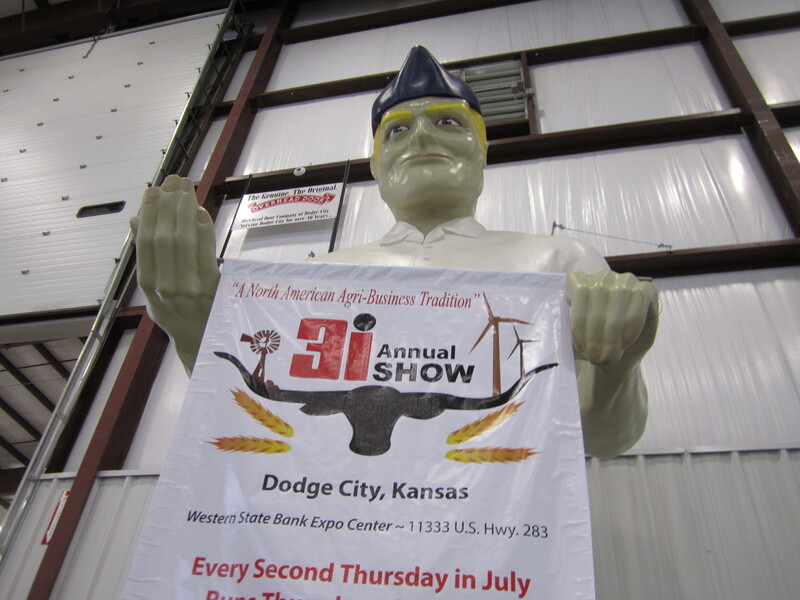 Muffler Men made prime time today when Dennis Hoppers “Giant Art Sculptures” were shipped from Anaheim, CA to Dodge City Kansas and the shipment was featured on A&E’s Shipping Wars. The pair were made from a mold cast from a LA muffler man back in 2000 and the next year they started traveling with Dennis Hoppers art show. They have been to many places in America and I have even seen pictures of one of them in Paris. They were made to resemble two iconic LA muffler men, the La Salsa m man in Malibu remodeled by Bob Wade and also a muffler man that was featured in a life magazine picture standing at a mobile gas station in the 60’s holding a poster for free 5 cent coupons. 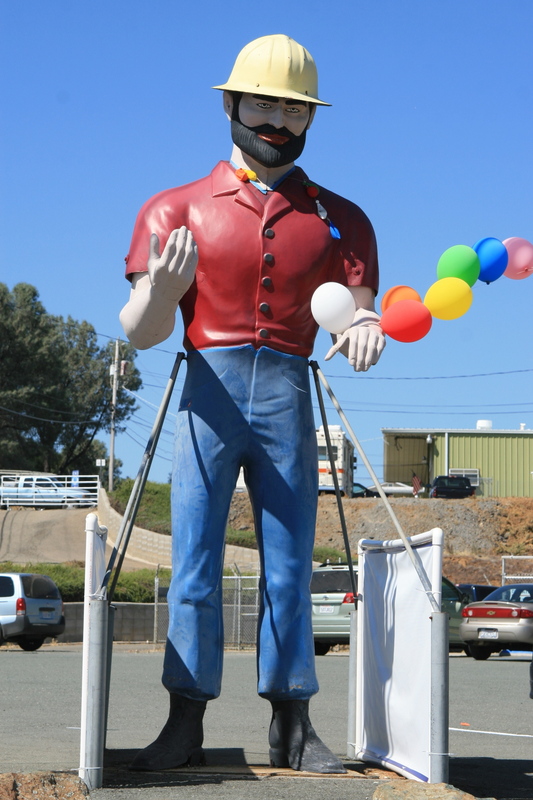 The Malibu muffler man still stands today but I’m not sure where the other ended up. 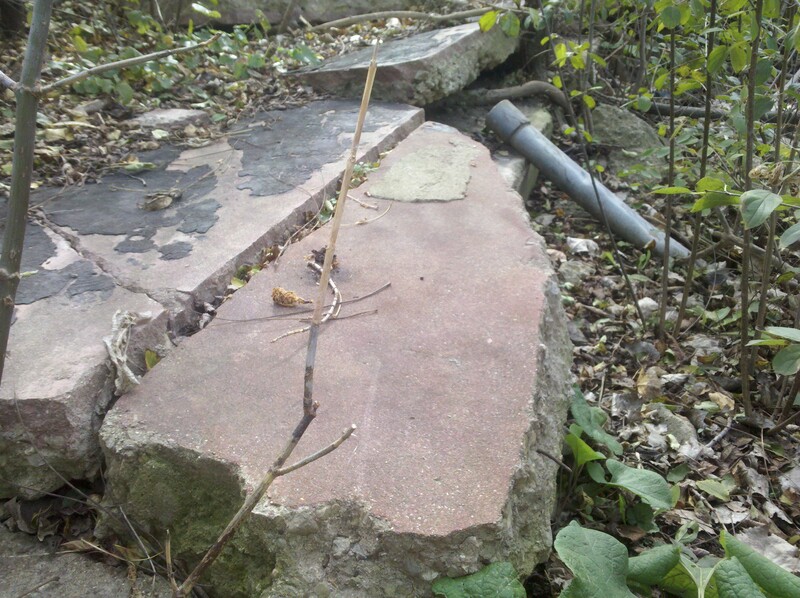 It is possible he is still in the area repainted and unrecognizable from his 1960’s picture or he may be long gone. The Dennis Hopper giants, estimated at a whopping $100,000 each, have been in storage for a few years and were recently donated by the Dennis Hopper Art Trust to the Carnegie Center for the Art’s who notified me about their arrival in Dodge and gave us a heads up about tonights episode of shipping wars. 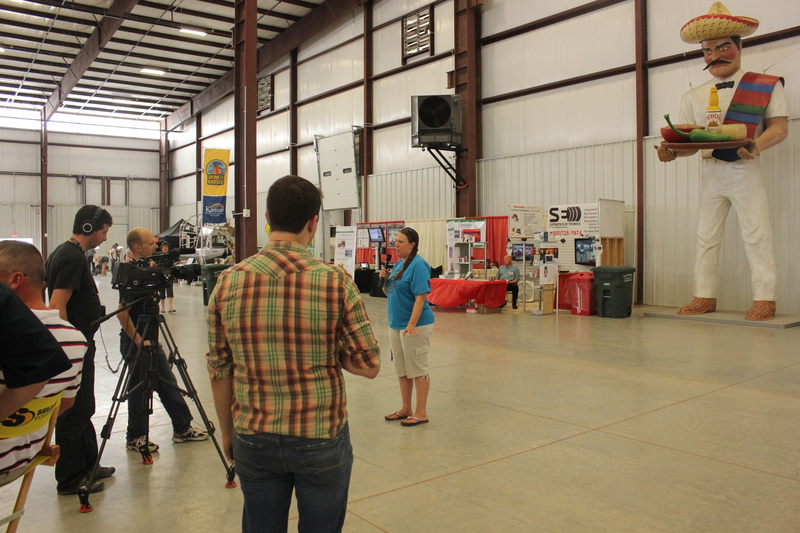 They will be on display July 11th through 13th at the Western State Bank Expo Center. 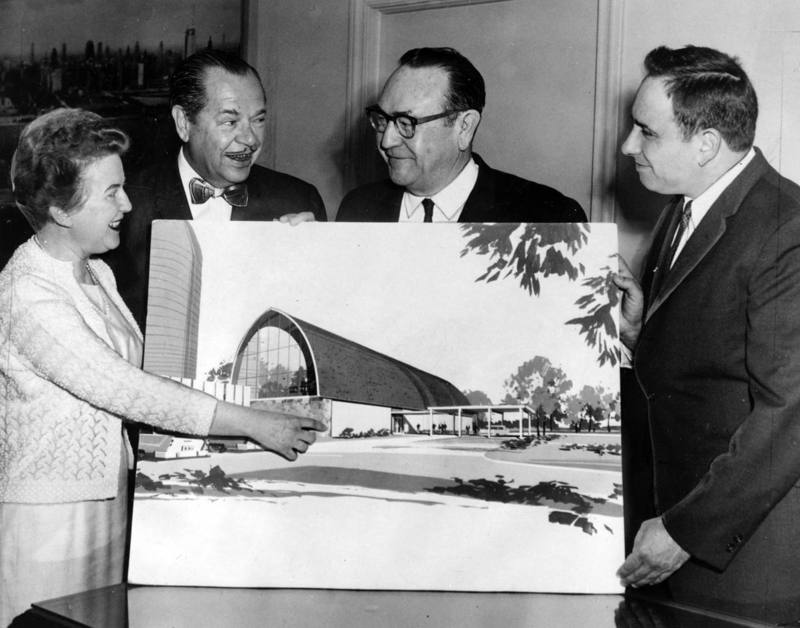 They are also currently working on a Multicultural park Design for their permanent home. It’s great to see these guys back out in view of the public and although not made by International Fiberglass in the 60’s they still certainly count as muffler men. 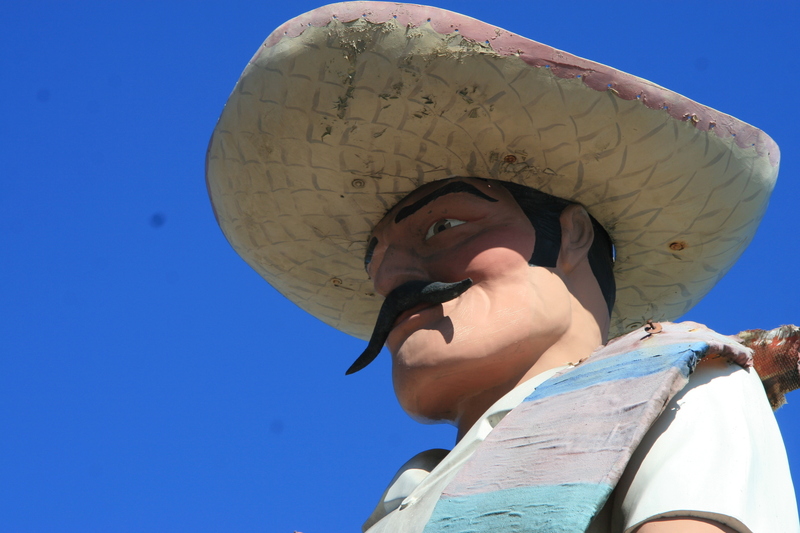 The muffler man that the mold was cast from is known as Tony and he stands at a car repair business in east LA. 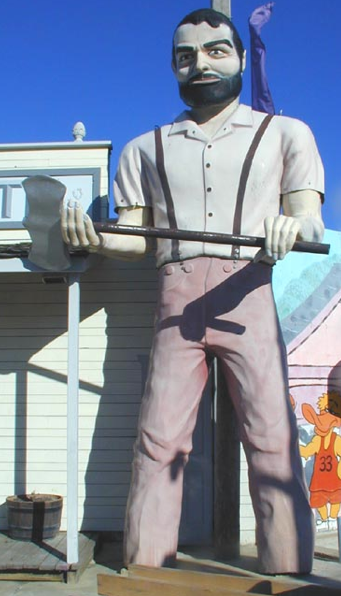 He disappeared briefly in 2000 and Roadside America even got a few ransom notes as a joke until it was discovered he was being used to make a mold for Dennis Hoppers muffler men. Tony happens to be one of the rare muffler men with a bow tie and so thats how the La Salsa man copy ended up with one. The original that stands in Malibu is the standard version but Dennis Hoppers clearly boasts a black bow tie and that’s how you can tell which one you are looking at. The other Dennis Hopper muffler man known as the “Mobile Man” was altered with a normal neck line and it sits a bit higher up than it does on other muffler men. 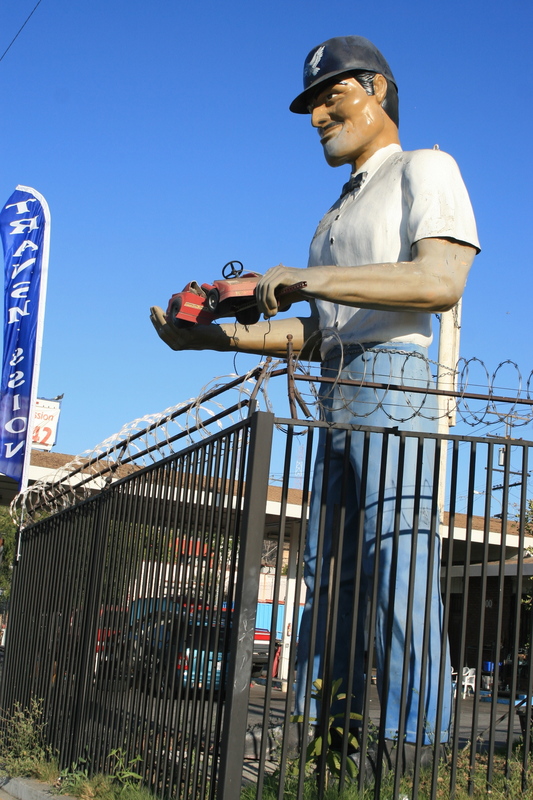 Tony still stands in east LA and was one of the earlier muffler men I visited when American Giants was just starting out. Needless to say we traveled out to Dodge City to check out the Dennis Hopper muffler men and get the scoop. Oh and interestingly enough these are not the first muffler men to call Dodge City their home.